If you are new to blogging it can be scary to leave yourself open to the world. And we have all seen the horrible comments left on the news articles and on YouTube. This isn’t CNN or YouTube. Most people are really nice in the foodie world and use the comment section to ask questions or say something lovely about your recipe. Word verification alienates your readers! A longsuffering, fellow blogger may jump through the hoops to leave you a comment, but Average Jane Reader is going to be intimidated. The harder you make it for her to leave a comment, the less likely she is to do so. I am not going to lie, there are still spammers. I receive 50 -100 spam comments a day on my main blog. Sometimes more. Am I worried about all that spam? Not at all. Blogger’s Spam Detection does a great job of catching most spam on blogger blogs and WordPress is great at catching spam. All you have to do is go in and delete your spam once a day to once a week. You don’t have to wade through it; just give it a glance, click all, and hit delete. Comment Location? Choose what you want. I like popup window, because after the reader is done commenting and they close the window, your post is still open giving them a chance to share it on Facebook or Pinterest. Who Can Comment? Click on Anyone! Comment Moderation? 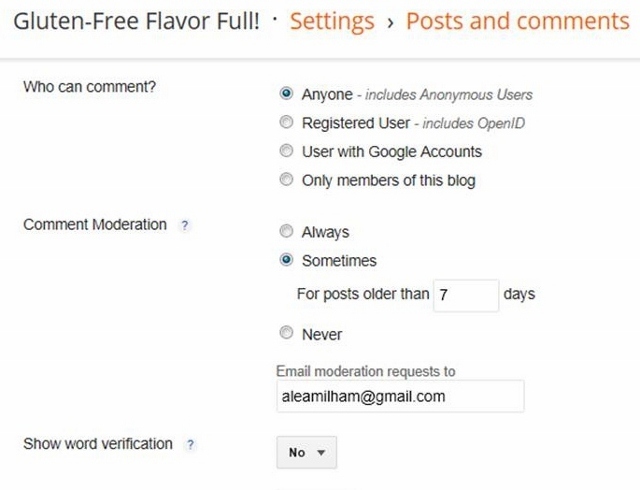 I usually click Never because Blogger’s Spam Detection does a great job of catching most of the spam, but if you are worried, click Sometimes and then choose to be notified of comments on posts older than 7 – 14 days. Spammers rarely leave comments on new posts. Show Word Verification? Click No! Make the world a better place and just say No to Word Verification! Comment Form Message? You can write a short message if you want in this space to your readers. If you limit comments or hold them for moderation, this is a good place to explain how and why you do what you do. Click Save Settings (the orange button) and then apologize profusely to your readers for unnecessarily tormenting them for so long. WordPress doesn’t come with word verification, so please don’t add one! If you are really worried, you can always use the askimet plugin (I am not an affiliate). There is something you can do to make it easier for your readers to comment. Now mouse down to Other Comment Setting and uncheck (make sure the box is blank) Users must be registered and logged in to comment. 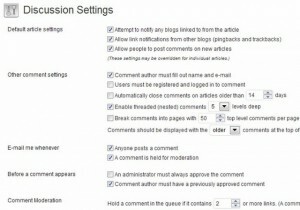 If you force people to sign in to comment, you are ensuring that the only people who comment are bloggers. If you blog on another platform, be thankful that I don’t know enough about the comment setting on your site to harass you. Because if I could, I would! So look at your settings and figure out a way to make it easier on your readers, before I figure out a way to harass you. If you really feel that you must have some form of spam protection, make it obvious from the beginning. If Captcha pops up, after I have hit the submit button, there is a very good chance I will never see it. By the time word verification pops up, I will have moved on, oblivious to the fact that you never got my witty comment. Amanda at Coping with Frugality asks readers to check a box to prove they are human when they leave a comment. It is obvious, it is easy, and since it does not involve squiggly letters, it is passes the humane test. Tammy, from Tammy’s Recipes, asks commenters to answer a simple math problem. Again, it is obvious and easy. Not as easy as checking a box, but since the numbers are not camouflaged and the answer never involves more than 2 digits, it is doable even at 2:00 in the morning. 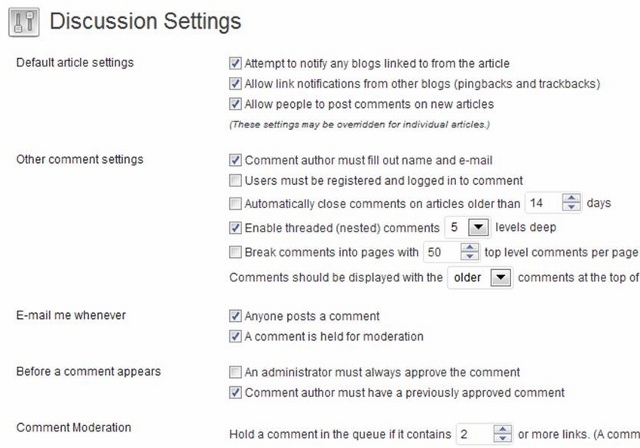 If you verify all comments before publishing, let your commenters know as early in the process as possible. If it isn’t obvious that the comment will not be published until you have approved it, a commenter might think they have made a mistake and leave the comment again, and again, and again. Then after realizing that you’re one of those “comment approvers”, leave you another comment telling you how embarrassed they are and ask you to delete 2 of the 3 comments they left and then they have to add a P.S. telling you not to publish this last comment asking you to delete all the others. And what is not said is that you have just wasted a lot of that reader’s time and they are leaving your blog annoyed. Pick your poison! Do not use spam guard and comment verification. People are taking time from their busy day to leave you a response, do not make them regret it! If I have not offended you with this post then you must make it easy for your readers to comment. Leave me a note in the comments, so I can come visit you! I have a Blogger blog, but I use Intense Debate for comments. I don’t think I have word verification turned on, but because I’m always logged in, I can’t really tell what it looks like to a non-admin reader. I do have my comments set to be moderated. If I don’t do that, I end up missing far to many of them. At this point, my blog is small enough that I can (and do try to) respond to each comment if I know it’s there. Offended! No way! Thank you for telling bloggers just how bad Capcha codes are. Very unwelcoming and not a bit user friendly. I have word press and I still have checked( Comment author must fill out name and e-mail ) I unchecked ( Users must be registered and logged in to comment ) Is that right? Thanks for all the great infromation you are providing. Hope my question isn’t to obvious lol! That is exactly right! If you require people to be logged in, only bloggers will comment. Most of your regular readers will be too intimidated to leave a comment. If you ever have a question, drop me an email. Most of my posts are inspired by email questions from fellow bloggers. Great post! I’ve never thought about that before, but you’re right. It’s so annoying trying to read those squiggly letters and I end up refreshing it so many times that I get frustrated. Just changed mine to NO. I know you’ve commented several times on my blog. Sorry!! I started out with Captcha too. We all do because it is the default setting. And since we can’t see it when we comment on our own blog, we forget it is there. Love this! I went back and forth between Blogger’s word verification on and off – if it’s on, it’s impossible to leave comments because no human can read those words, but if it’s off, then yes, the spam filter does a great job catching spam, but I still get a million emails from my blog notifying me of viagra comments. I just installed Intense Debate with CommentLuv plugin – do you know if that will mean I will still get those Spam emails? Or does Intense Debate somehow filter them out before I even get notified (I checked that Akismet spam filter thingy).